Our philosophy is that we can maximize results for our clients by accepting a limited number of cases and thoroughly preparing every case for trial so that we are never forced to settle. When a person suffers a severe debilitating personal injury, or worse, has lost a loved one due to someone else's negligence or indifference, the impact is devastating. People often take for granted their ability to work and enjoy physical activity on a daily basis. The impact is crushing once one who is injured realizes their life may never be the same. DeNittis Osefchen understands through our compassion and experience how one's life and family is turned upside down by severe injuries or unexpected death. It is important that you have experienced trial lawyers representing you and thoroughly preparing your case to maximize your recovery. While money will never reverse the catastrophic issues persons face, it does help severely injured persons and their families live comfortably. Without such an ability to pursue a personal injury case, individuals and families who are injured and unable to work would suffer bankruptcy and mounting medical bills. We concentrate on doing everything we can to help injured persons and their families. How do we do that? At DeNittis Osefchen, P.C. we maximize the results for our clients by accepting a limited number of cases and preparing every case as if it is going to trial. We devote the necessary financial and legal resources to present your case as favorably as possible while at the same time providing guidance and assistance to you on various legal issues during the pendency of your case. Our firm represents injured people and surviving family members throughout New Jersey and Pennsylvania in personal injury and wrongful death claims involving matters such as: -Motor Vehicle Accidents: auto accidents, motorcycle accidents, interstate trucking accidents, and more -Unsafe Premises: slip and fall accidents, dog bite cases, construction site accidents, and more -Defective Products: defective workplace equipment, dangerous toys, faulty auto parts, and more -Medical Malpractice: handling cases involving physicians, nurses, hospitals and other health care providers -Construction Site Accidents: falls, dangerous conditions at the worksite, OSHA violations, scaffolding, trap doors, unsecured railings and steps. -Brain Injury: blunt trauma, closed head injuries, fractures, and loss of brain function including permanent brain damage -Wrongful Death: Injuries in these cases can be catastrophic and include spinal cord trauma, paralysis, second-degree burns, third-degree burns, closed-head injuries, multiple fractures, amputations, herniated disks, and others. As experienced attorneys, we know that these injuries inflict not just a tremendous amount of physical pain, but that they can also thrust you and your family into a precarious position financially and emotionally. We look to help our clients in every possible way and fight hard to make sure they come through this difficult time with minimum of upheaval. Contact DeNittis Osefchen, P.C. Attorneys at Law at our Marlton, New Jersey law offices today for a free consultation about your specific case with a highly skilled New Jersey personal injury lawyer. Stephen P. DeNittis is a named shareholder with DeNittis Osefchen, P.C. 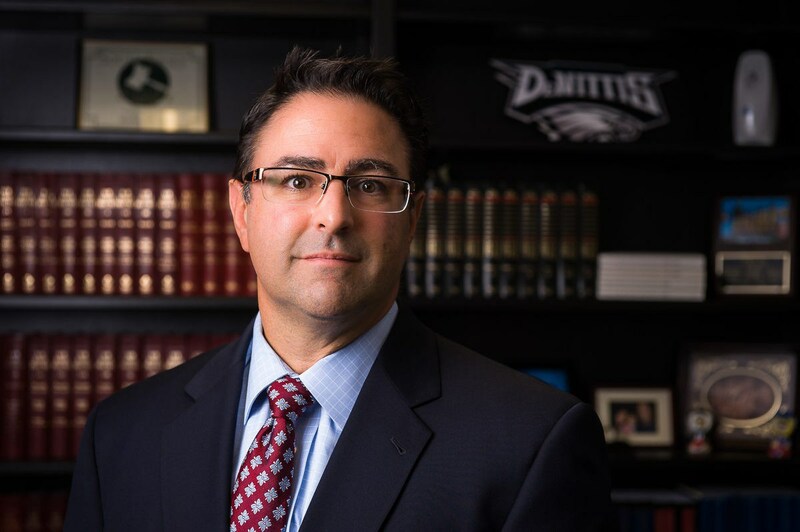 An experienced consumer fraud class action litigator and catastrophic personal injury litigator, Mr. DeNittis has recovered millions of dollars for victims of severe injury or corporate fraud in federal and state courts across the country. He currently serves as lead or co-lead counsel in many class actions currently pending in federal and state court. Since 1998, Mr. DeNittis has successfully served as lead or co-lead counsel in over ninety (90) class actions involving consumer fraud, false advertising, construction defects, wage and hour violations, RESPA violations and mass tort litigation throughout the country. -France v. Merrill Lynch, where Mr. DeNittis served as co-lead counsel in a wage an hour violation action and obtained final approval in 2009 of a $43.5 million class action settlement on behalf of a class of 22,000 Merrill Lynch stockbrokers in the United States District Court for the District of Oregon. -DeMarco v. National Collector's Mint where Mr. DeNittis was lead counsel and obtained a settlement valued at $9 million dollars on behalf of a class of 176,000 class members who were defrauded into purchasing a fake coin allegedly issued by the U.S. Mint to commemorate the "9/11 Terrorist Attack. The case was a matter of first impression in the United States District Court for the Southern District of New York under the Hobby Protection Act 15 U.S.C. 2101(b) and is now a published opinion in the Federal Reporters. 229 F.R.D. 73 (S.D.N.Y. 2005). Mr. DeNittis was also plaintiffs' trial counsel in Barkers v. Public Service Electric and Gas (PSEG) where he obtained an order for PSEG to install excess flow valves or place cement protective bollards to approximately 2,800 residential and commercial gas meter sets located throughout the State of New Jersey. PSE&G negligently placed meters in a dangerous condition, in close proximity to persons' driveways, garage doors or parking areas. As a result of Mr. DeNittis' efforts in the case, the New Jersey Board of Public Utilities proposed and adopted new rules and regulations in December of 2004 prohibiting any new or existing gas meters from being installed in the State of New Jersey within 3 feet of any garage door, driveway or parking area. Mr. DeNittis was also lead trial counsel in Schmoll v. J.S. Hovnanian, a class action that settled after four days of trial which resulted in J.S. Hovnanian repairing a construction defect found in 995 homes in the Holiday East development in Mt. Laurel, New Jersey. He is admitted to practice in New Jersey, Pennsylvania and before the United States Supreme Court and many other federal courts. In 2013, he was designated by the Supreme Court of New Jersey as a Civil Trial Attorney, a high honor of achievment as only 1.5% of attorneys in New Jersey hold such a designation. He is also rated AV, the highest rating given by Martindale Hubbell, the country's foremost legal directory. He has also been named a "New Jersey Super Lawyer" in 2013 (and previously a "New Jersey Rising Star" from 2006 thru 2011) by Law and Politics Magazine and New Jersey Monthly where he was recognized in the top 2.5% of attorneys practicing in New Jersey. Also he has been recognized in 2011, 2012 & 2013 by SJ Magazine as Top Class Action lawyer and South Jersey Magazine as an "Awesome Attorney" in the field of Personal Injury. Aside from his work, Mr. DeNittis financially sponsors and coaches his two daughters' soccer and softball teams. He also is a lifelong rabid Philadelphia Eagles fan and has been a season ticket holder since 1997. Mr. DeNittis is also an officer of the Board of Directors for the Ronald McDonald House Southern New Jersey charity.